It's a wrap for Thugs Of Hindostan's Jodhpur schedule and Amitabh Bachchan is back home. The 75-year-old actor shared snippets of his journey and finally, of the moment when he arrived at home in Mumbai. 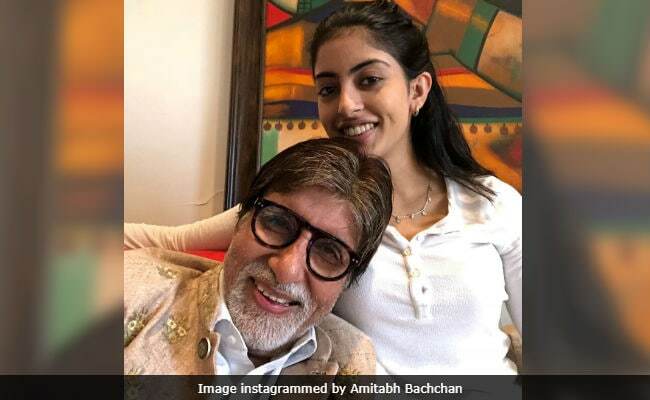 Big B instagrammed a selfie he took with his granddaughter Navya Naveli (daughter of Shweta and Nikhil Nanda). "Home where the love is," he wrote. Mr Bachchan, who fell ill while filming Thugs Of Hindostan in Jodhpur, looked healthy and happy in this absolutely adorable photo with Navya. Big B had shared pictures from inside the aircraft when he was en route Mumbai. .... home where the love is .. Schedule over .. start up the engines Captain .. and head me home ..
On his blog, Amitabh Bachchan emphasised on how relaxed he is at his home. "Travel out destinations are all well and well looked after but the presence of home is home. The familiar presence, the objects the routine the feel at once all-encompassing and reassuring and despite long aways from home, nothing is ever forgotten or lost to memory. It's all just there." Of reuniting with his family members and how he plans to spend the upcoming days, Big B wrote: "Children give the warmth of attention and care that constant chair of preference... A few days of catching up and assessing the times to come and then rest." When he was shooting for the Yash Raj Films project, Amitabh Bachchan complained of severe neck and back pain and a team of doctors from Mumbai was flown to Jodhpur to look after him. At that time Big B's wife Jaya Bachchan had blamed the "heavy costumes" the actor wore while filming for agitating his neck and back. Thugs Of Hindostan aside, Mr Bachchan will soon start film Brahmastra. His co-stars Alia Bhatt and Ranbir Kapoor have already begun filming in Bulgaria. Amitabh Bachchan is also awaiting the release of 102 Not Out, co-starring Rishi Kapoor.